This week we have launched A Rainforest Reborn, a new film for Crees that reveals rarely-seen footage of spider monkeys feeding at a mammal clay lick in our nature reserve. As seed dispersers, spider monkeys are an essential part of tropical rainforests, allowing their environment to continue growing. However, the Peruvian spider monkey (ateles chamek) are also highly endangered, largely due to habitat loss and threats from hunting. They tend to prefer mature, primary forests over regenerating areas. Yet, as is so widely publicised, these areas are being destroyed at an alarming rate. The fact that many families of spider monkey have made their home in the Crees Reserve, a regenerating rainforest which was previously destroyed for farmland and logging, is a symbol of great hope for conservation. Capturing such rare footage of these monkeys taking part in this dangerous but integral feeding ritual at our clay lick is all the more incredible. The Manu Learning Centre (MLC), our research base in the heart of the Peruvian Amazon, is home to not only one but three clay feeding spots: two in the body of the forest itself, and one along the banks of the Alto Madre de Dios river, where thousands of colourful macaws and parrots feed every day. Whilst this is an incredibly interesting and at times extremely colourful display of animal behaviour, the reason for it has been a bit of a mystery for science. It may be that animals eat clay to neutralise their stomach and remove toxins from their otherwise acidic diet. Other studies have suggested that by eating clay, animals like our spider monkeys are supplementing a sodium-poor diet, as the the western Amazon basin is lacking in salt. 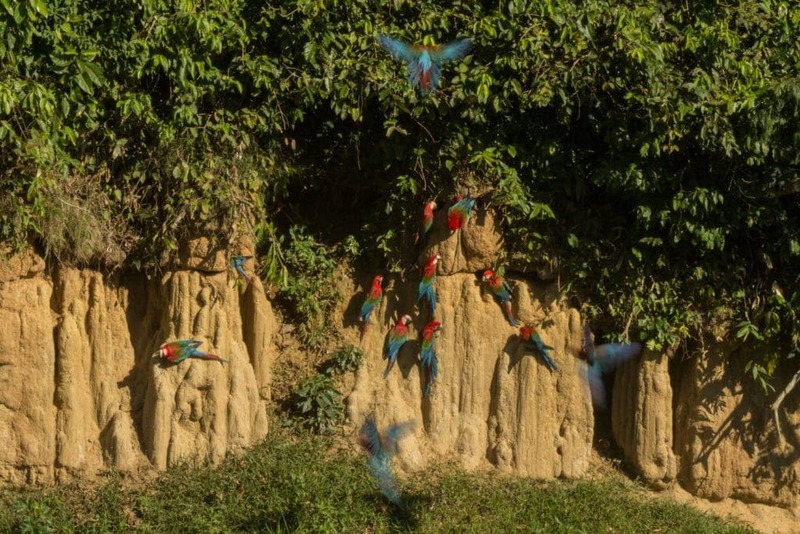 Visitors to the MLC can experience macaws, parrots and parakeets flying overhead and feeding at the colpa, but it is extremely rare to witness mammals feeding in the clay lick, not to mention to film them doing so. This is why we’re extremely excited to release A Rainforest Reborn - an amazing story of rainforest recovery and return of endangered animals like these spider monkeys.